Venus is special to us as it is Earth’s closest neighbor in our solar system! If we could notice any object in the sky that is the brightest (except moon), then it would be Venus. Many people call it a bright star that can be seen in the morning and evening sky, but it is a planet of our solar system! Later, the Greek mathematician and astronomer Pythagoras discovered that both objects seen as the morning and evening star were, in fact, the same object. Do you know that you can see Venus either in the morning before sunrise or evening after sunset? Venus becomes visible in the evening after sunset when its orbit overtakes Earth’s orbit; until that, it can be seen only in the morning hours before sunrise. Due to its closeness with the Sun, it can always be seen in the morning and evening sky with naked eyes. When viewed through a scope, Venus can be seen, just like the moon, in phases. This was first observed by Galileo in 1610! Unlike all other planets, its rotation on its axis is not only retrograde (clockwise) but also very slow! It makes one rotation in 243 Earth days. Scientists guess that a clockwise rotation of Venus may be due to its collision with an asteroid or some other large object in the past. Its retrograde rotation may give us another pleasant surprise! Being at Venus, we would notice sun rising from the west instead of the east! 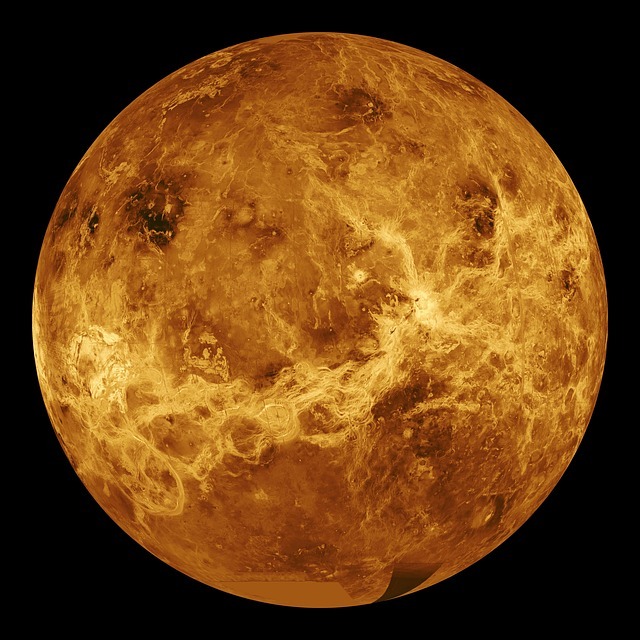 Venus is also known as a windy planet as winds blow there with the speed of 720 kilometers per hour that is much higher than the wind speed observed during the deadliest cyclone ever happened on our Earth. Venus has a diameter of almost 12,100 km, which is less than the diameter of the Earth. Its mass is said to be 4.87 x 1021 metric tons (close to 82% of the mass of the Earth). Due to lesser mass, the gravitational force exerted is also less than what experienced at the Earth. By every means, Venus is not a hospitable place for life at all! Another surprise may be in store for us that there are no seasons at Venus because the planet doesn’t tilt on its axis, which is the case with our Earth. Round the year, the planet keeps on boiling at high temperature! Venus has a real hell-like atmosphere; the average temperature goes up to 462 degree Celsius, which is the highest among all the planets in our solar system. No surprise that even lead would melt on its surface quickly! Such a high temperature is due to dense clouds in its atmosphere that causes a greenhouse effect. To make matters worse, these clouds are made of sulfuric acid! Venus has more than 1600 major volcanoes, which is much higher than any other planet in our solar system. It does have numerous smaller volcanoes too! But you might be wondering how Venus is filled with so much of the sulfuric acid clouds! Volcanic eruptions are the main culprits eschewing tons of sulfur dioxide gas in the atmosphere. Coming into contact with sun rays, the sulfur dioxide gas gets converted into clouds of concentrated sulfuric acid. The atmosphere of Venus is 96.5 percent composed of carbon dioxide, and the balance is nitrogen. Surprisingly, its atmosphere rotates 60 times faster than the rotation of Venus itself; that is indeed a mystery! Scientists have found that the atmospheric pressure at Venus is as high as 90 Bar against 1 Bar found at the sea level of the Earth. This is the pressure that one will experience when one goes one kilometer deep in the ocean of the Earth! Does not this surprise you? Suffice it to say that the human body or any other species of the Earth cannot survive such huge atmospheric pressure at Venus! To view Venus, we need to know certain facts about Venus. Venus completes one orbit around Sun in 225 days, which is a shorter period than what Earth takes to orbit Sun (365 days). Due to this, Venus could be either nearest or farthest from the Earth in any year! When Venus is between the Sun and the Earth, it could be as close as 40 million kilometers. When the Sun is between the Earth and Venus, the distance between the Earth and Venus is the farthest up to about 260 kilometers. Being closer to the Sun, we can see Venus only for about three hours before sunrise, or for the same period after the sunset! In the morning, we can find it in the east moving ahead of the Sun. It is easily visible with the unaided eyes when the Sun has not risen yet. In the evening, we can see it in the west following the Sun ready to set soon. It is easily visible with the naked eye once the Sun is set and will remain visible for at least three hours or so. Venus is much easier to locate as it is a brightest star-like object with the elongation between 45 degrees and 47 degrees! Venus usually appears white when seen through telescopes. While its clouds are pale or yellow, it is difficult to identify them in the glare surrounding it. At its greatest elongation, Venus can be seen half-phase (50%). While viewing through a telescope, its glare can be reduced by using blue, yellow and violet filters. Orange and red filters can be used to reduce the brightness of the sky when observed in daylight. Any magnification over 200x will not be helpful for its clear viewing! You might be wondering what the transit of Venus is! Occasionally, Venus gets between Sun and the Earth. At this time, we can notice a black dot moving across the Sun. It is somewhat like an eclipse of the Sun! The transits of Venus are not frequent. One such transit occurred on June 6, 2012. Unfortunately, we will not see any transit in this century! The next one will occur on December 10/11, 2117 – almost a century later! Usually, transits occur in pairs (difference of almost eight years between them). This means another one would occur in AD 2125. In the past, the transit of Venus helped astronomers to find out the distance between the Earth and the Sun! The transits are important events for scientific studies as it helps scientists to gauge the planet’s size! Advancement in technology has revealed many facets of Venus. Previously, Venus’s surface details were not available. Currently, scientists have gathered more details on its surface through radar mapping. Radar mapping uses microwave radiation instead of light radiation, and microwave radiation can easily pass through the thick layers of its clouds. According to experts, three layers constitute Venus’s interiors: a crust, a mantle, and a core. While Venus’s crust is almost 50 km thick, its mantle is as thick as 3,000 km. And, its core (the innermost layer) has a diameter of 6,000 km. The Radar mapping data reveals that Venus has four main mountain ranges called Akna Montes, Maxwell Montes, Frejya Montes, and Danu Montes. Venus has been mentioned extensively in a variety of mythological texts and scriptures. She has become the symbol of feminine beauty across many cultures. Aphrodite (same as the Roman Venus) is the goddess of love in Greek mythology; she embodies love, pleasure, and fertility. Venus is known as ‘Shukra’ (bright or white) in Hindu mythology as the indicator of love, beauty, and happiness. How to View the North Star or Polaris? Can We View Sirius with Telescope?